Mentor Securities, LLC ("Mentor Securities") is a member of the Securities Investor Protection Corporation (SIPC) and a registered U.S. Broker-Dealer. By using this site you agree to certain terms and conditions, which Mentor may modify. You acknowledge that, except for insured Certificates of Deposit, any investment products that may be referenced on this Site are not FDIC-insured, not bank-guaranteed and may lose value. This Site is for informational purposes only and does not constitute an offer to sell or a solicitation of an offer to purchase any security which may be referenced herein. Offers can only be made where lawful under applicable law. This Site is for informational purposes only, and is not an offer by Mentor Securities to sell you any security referred to on the Site. You may not use the E-mail function to enter an order to buy or sell a security, to send us time-sensitive instructions, or to give us personal credit information or an address change. This Site is for your personal use only and its contents are protected by applicable copyright, patent and trademark laws. Mentor Securities is not agreeing to nor required to update any information available on the Site. Therefore, that information may not reflect events occurring after the date of publication. Mentor Securities is not responsible for any delays or errors in any information or services you use on the Site or for systems performance or damages to your computer or software, as a result of using the Site. Mentor Securities may discontinue or change, at any time, any of the services available through www.mentorsecurities.com. Mentor Securities may cancel or amend the terms and conditions at any time. THE ACCURACY, COMPLETENESS, SEQUENCE OR TIMELINESS OF THE INFORMATION ON THE SITE CANNOT BE GUARANTEED. 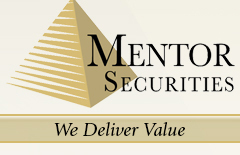 MENTOR SECURITIES AND ITS AFFILIATES, AGENTS AND LICENSORS SHALL NOT HAVE ANY RESPONSIBILITY FOR DIRECT, INDIRECT, CONSEQUENTIAL, SPECIAL, OR OTHER DAMAGES YOU MAY INCUR FOR ANY RELIANCE BY YOU ON INFORMATION OR FOR THE RELIABILITY, ACCURACY, COMPLETENESS, SEQUENCE OR TIMELINESS THEREOF, OR FOR ANY DELAYS OR ERRORS IN THE TRANSMISSION OR DELIVERY OF ANY PART OF THE INFORMATION OR SERVICES, OR FOR ANY UNAUTHORIZED USE BY YOU OF E-MAIL. YOU UNDERSTAND THAT ANY TERMS THAT MAY BE PROVIDED AS PART OF THE SERVICES MAY BE DELAYED AND MAY NOT REFLECT THE PRICES AT WHICH THE SECURITIES MAY BE BOUGHT OR SOLD. YOU SHOULD NOT MAKE ANY DECISIONS TO BUY SECURITIES BASED ON ANY INFORMATION ACCESSED ON OR THROUGH THE SITE. YOU UNDERSTAND THAT MENTOR DOES NOT GUARANTEE THAT IT WILL CONTINUE TO MAKE THE INFORMATION AND SERVICES AVAILABLE TO YOU, WHETHER BY THE SAME METHODS CURRENTLY USED OR OTHERWISE. YOU AGREE NOT TO HOLD MENTOR SECURITIES LIABLE FOR ANY DAMAGES ARISING FROM A DISCONTINUATION OR MODIFICATION OF ALL OR PART OF THE SERVICES OR INFORMATION. EXCEPT AS EXPRESSLY SET FORTH HEREIN, MENTOR SECURITIES AND ITS AFFILIATES, AGENTS AND LICENSORS HEREBY EXPRESSLY DISCLAIM ALL EXPRESS AND IMPLIED WARRANTIES, INCLUDING WITHOUT LIMITATION, WARRANTIES OF MERCHANTABILITY, FITNESS FOR A PARTICULAR PURPOSE, AND ERROR-FREE AND UNINTERRUPTED SERVICES. MENTOR DOES NOT WARRANTY, GUARANTY, OR MAKE ANY REPRESENTATIONS OR WARRANTIES WHATSOEVER, EXPRESS OR IMPLIED, OR ASSUME ANY LIABILITY TO YOU REGARDING (i) THE USE OR THE RESULTS OF THE USE OF THE SERVICES, INCLUDING WITHOUT LIMITATION ANY FINANCIAL RESULTS BASED ON USE OF THE SERVICES OR INFORMATION OR ANY DELAY OR LOSS OF USE OF THE SERVICES OR, (ii) SYSTEM PERFORMANCE AND EFFECTS ON OR DAMAGES TO SOFTWARE AND HARDWARE IN CONNECTION WITH ANY USE OF THE SITE, SERVICES, AND INFORMATION. IN ADDITION TO AND WITHOUT LIMITING THE FOREGOING, MENTOR SECURITIES SHALL NOT BE LIABLE FOR ANY HARM CAUSED BY THE TRANSMISSION, THROUGH THE SERVICES OR INFORMATION, OF A COMPUTER VIRUS, OR OTHER COMPUTER CODE OR PROGRAMMING DEVICE THAT MIGHT BE USED TO ACCESS, MODIFY, DELETE, DAMAGE, CORRUPT, DEACTIVATE, DISABLE, DISRUPT, OR OTHERWISE IMPEDE IN ANY MANNER THE OPERATION OF THE SERVICES OR ANY OF YOUR SOFTWARE, HARDWARE, DATE OR PROPERTY. IN ADDITION TO AND WITHOUT LIMITING THE FOREGOING, MENTOR SECURITIES MAKES NO REPRESENTATION AND ASSUMES NO LIABILITY REGARDING THE QUALITY, SAFETY, ACCURACY, OR SUITABILITY OF ANY INFORMATION OR SOFTWARE FOUND ON ANY OTHER SITE NOT UNDER MENTOR SECURITIES’ CONTROL. MENTOR SECURITIES AND ITS AFFILIATES, AGENTS AND LICENSORS SHALL NOT BE LIABLE FOR ANY LOSSES OR DAMAGES INCURRED BY YOU RELATED IN ANY WAY TO YOUR USE OF THE SERVICES AND INFORMATION. EXCEPT AS OTHERWISE PROVIDED BY LAW, MENTOR SECURITIES SHALL HAVE NO LIABILITY FOR LOSSES CAUSED BY THE NEGLIGENCE, ACTIONS OR FAILURE TO ACT OF THE PROVIDER OR ANY THIRD PARTY PROVIDER, AND TO THE EXTENT PERMITTED BY LAW, NEITHER MENTOR SECURITIES NOR THE PROVIDER OR ANY THIRD PARTY PROVIDER SHALL BE LIABLE TO YOU FOR ANY INDIRECT, SPECIAL, INCIDENTAL OR CONSEQUENTIAL DAMAGES (REGARDLESS OF WHETHER SUCH DAMAGES ARE REASONABLY FORESEEABLE), OR FOR ANY LOSS THAT RESULTS FROM A CAUSE OVER WHICH MENTOR SECURITIES OR ANY OTHER SUCH ENTITY DOES NOT HAVE CONTROL, INCLUDING BUT NOT LIMITED TO FAILURE OF ELECTRONIC OR MECHANICAL EQUIPMENT, UNAUTHORIZED ACCESS, STRIKES, FAILURES OF COMMON CARRIER OR UTILITY SYSTEMS, SEVERE WEATHER, OR OTHER CAUSES COMMONLY KNOWN AS “ACTS OF GOD”. GOVERNING LAW. Except for statutes of limitation applicable to claims, all the terms herein shall be governed by and construed in accordance with the laws of the State of California without giving effect to principles of conflicts of law. The statute of limitation applicable to any claim shall be that which would be applied by the courts of the state in which you reside. These Terms and Conditions represent the complete and exclusive statement of the understanding between you and Mentor Securities regarding your rights to access and use the Services and Information on the Site, and supersedes all prior and contemporaneous agreements and representations regarding such subject matter. Except as herein provided, no waiver, modification or amendment of any provision of these Terms and Conditions shall be effective against Mentor Securities unless the same is in writing and signed by an authorized official of Mentor Securities. Mentor Securities may modify these terms and conditions at any time upon written notice or posting to the Site. You agree that if you use the Services after such notification of changes, you will be bound by all such changes. At the time of such modification, you will have the opportunity to reject such modification, which rejection shall constitute a termination of your rights to access and use the Site, Services and Information. Should any term or provision of these Terms and Conditions be deemed or held to be invalid or unenforceable, the remaining terms and provisions shall continue in full force and effect. Mentor Securities failure to insist at any time upon strict compliance with any term of these Terms and Conditions or any delay or failure on Mentor Securities part to exercise any power or right given to Mentor Securities, or a continued course of such conduct on Mentor Securities part shall at no time operate as a waiver of such power or right, nor shall any single or partial exercise preclude any other future exercise. All rights and remedies given to Mentor Securities are cumulative and not exclusive of any other rights or remedies which Mentor Securities otherwise has at law or equity. INDEMNIFICATION. You hereby indemnify and hold harmless Mentor Securities (and its directors, officers, employees, control persons, vendors, licensors and agents), the Provider and any third party provider from and against any and all claims, losses, liabilities, damages, costs and expenses (including reasonable attorney’s fees and costs) arising out of or related to your breach of your agreements, representations and warranties contained herein or your use of the Services or Information (i) in violation of these Terms and Conditions, (ii) in violation of any rights of Mentor Securities, the Provider and any third party Information provider, including copyright, patent, trade secret, trademark, or other intellectual property rights and publicity and privacy rights, or (iii) in violation of any applicable law, rule or regulation, or (iv) your failure to maintain the security of your User Codes as applicable. This indemnification shall be binding upon you and your executors, heirs, successors and assigns.